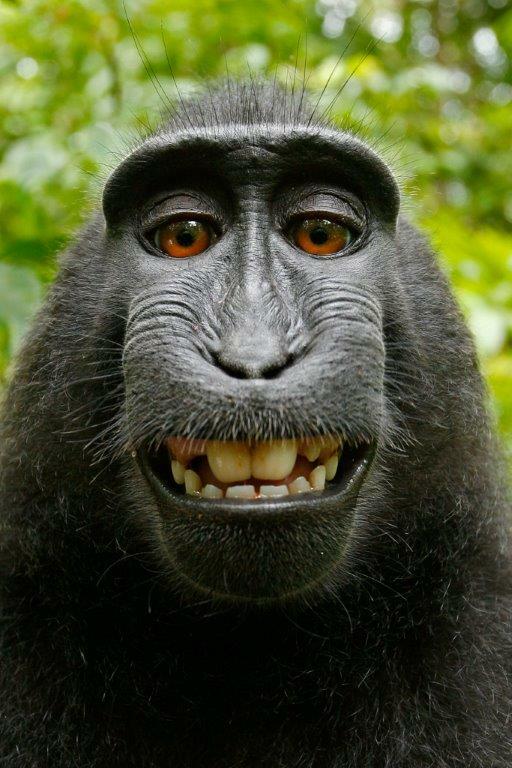 Whether you are generally interested in the law or not, many of you will have heard of the case of the ‘monkey selfie’. There had been a long-running battle in the US courts over who owned the copyright, which has just been settled. In 2011, Welsh wild life photographer David Slater, from Monmouthshire, was working in the Indonesian jungle.He was trying to gain the trust of macaque monkeys in order to take some good photos of them. Suddenly, a monkey picked up his camera and took some selfies. One of the selfies is shown here (with copyright permission – see below). Understandably they went viral when David Slater published them. The monkey in question is referred to in the media as Naruto, but during the court case his exact identity was in dispute. Can a monkey own copyright? In 2015, a well- known animal rights group PETA (‘People for the Ethical Treatment of Animals’) issued proceedings ‘on behalf of the monkey.’ They claimed that the monkey had taken the photo and therefore owned the copyright. Therefore, it followed that David wasn’t entitled to publish (presumably unless he had permission, which would be hard) or keep any proceeds from such publication. The case by PETA could have broken new legal ground, at least in the States (and we often follow their lead in things). It would have established that a) animals have civil rights and b) humans can enforce such rights on their behalf. A distinction needs to be made here with criminal law. There are lots of animal rights which we humans (rightly) have determined exist and are enforceable by criminal prosecution. The RSPCA and many others are doing it every day, bringing cases for cruelty and mistreatment generally. Civil law rights would be breaking new ground. This year, San Francisco judges dismissed the case by PETA. But PETA appealed. Finally, a settlement has been reached. According to media reports, David Slater has agreed to donate 25 per cent of any future revenue to registered charities ‘dedicated to protecting the welfare or habitat of Naruto’. This contrasts with an earlier 2015 ruling in New York concerning chimpanzees kept for research. The court then held that they did at least have the ‘right’ not to be held in captivity. So civil rights for animals still have to be established, and certainly there are no cases which go that way in the UK. By contrast, sadly, a lot of animals have appeared as Defendants, albeit only in criminal trials. Historically there are many examples, with charges wide-ranging. The earliest recorded is a pig executed after a trial in France in 1266. Another pig and her piglets were put on trial for murder in 1457. The sow was convicted and her piglets acquitted. Surprisingly, cases continue to the present day. In 2013, a case was filed against a cat after it was apprehended smuggling mobile phones and chargers into a Russian prison. In 2010, a pigeon was arrested in India for spying on behalf of Pakistan, having flown in, with a Pakistani number stamped on its body with red ink (if it was in fact a spy, clearly it was not a very good one). It was eventually discharged for lack of evidence. As recently as June 2016, India rounded up 18 lions on a charge of murder. The sentence of the culprit was life imprisonment (in a zoo) which at least shows we live in more enlightened times than the Middle Ages. The pictures of Naruto (or whichever other monkey is the selfie monkey) have of course appeared everywhere on the net since first published, including on household name sites. Many people obviously took advantage of the case and banked on the monkey not enforcing copyright (although might PETA or another charity have done so on its behalf if the case had been successful?). The case is specific to its facts – selfies by animals are new to law, but the court has applied traditional principles. The creator of a work owns the copyright (subject to any exceptions in law) and David Slater was confirmed as the creator here, it was all part of his creative ‘photographic’ process in effect. Assuming he even had the appetite, I wonder if David Slater is now making any claims retrospectively for breach of copyright, or whether that was dealt with in the settlement terms.